This A Series Screen from SG Audio Visual features a stretch-resistant Fiberglass screen surface and a quality tube motor. This screen comes with a wireless remote control and an up/down/stop control built into the power cord. Recommended for rooms up to 4m wide. 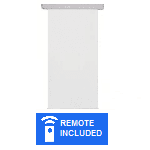 The New A Series Electric screen with Intelligent control includes both a wireless remote control and a wireless wall switch eliminating significant cabling costs. 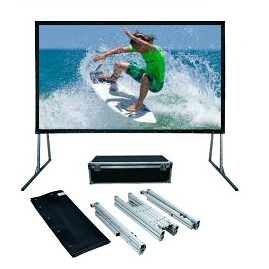 The screen features a commercial grade fiberglass screen surface which resists stretching and a quiet tube motor. Highly recommended. This 3m wide commercial grade screen is in the squarer 4:3 format and is 3m wide by 2.25m long. The screen has a stretch resistant fiberglass surface and a wireless remote control as well as a control in the power cord. 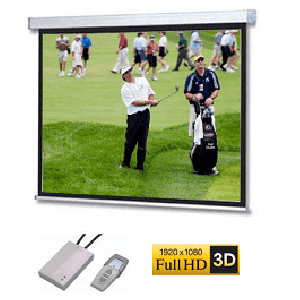 We recommend this screen for older XGA projectors or as a replacement screen. 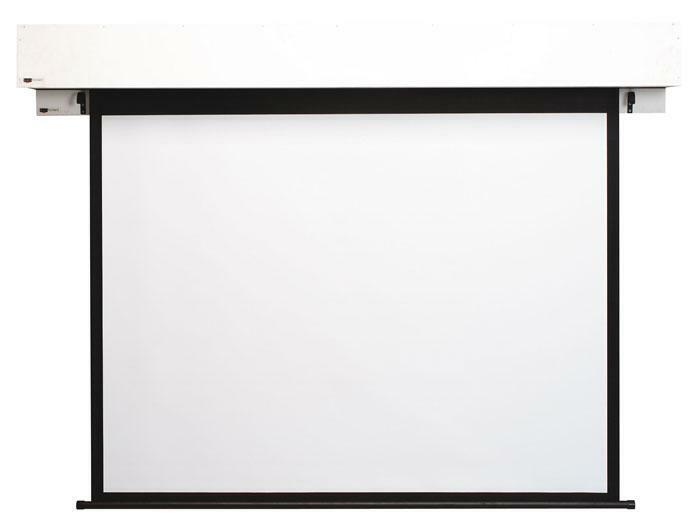 This new generation EA Series screen features a one-piece surface and intelligent control system. Control the screen with either the wireless remote control or a the included wireless wall switch or buy additional control options for a wired switch or low voltage control. This screen is 4.2m wide in 16:10 format and suits school, church and community halls and larger spaces in conference facilities. This AP Series screen has a unique design. The "quadpod" has 4 legs providing better stability than tripod screens. 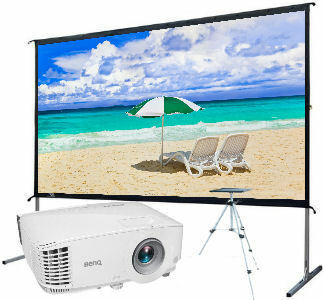 It packs down to around 1.1m long making it suitable for transport anywhere but provides a large 1.8m wide image. 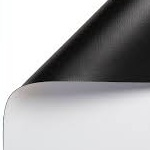 Its unique PET high gain surface provides a brighter image than tripod screens. 1.8m wide Rugged Pull-up Screen. Built tough with Metal housing with built-in handle. 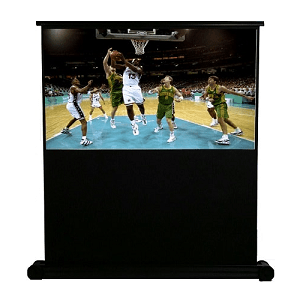 This PC series Tough pull-up screen is designed for use with a business/education WXGA or WUXGA projector. 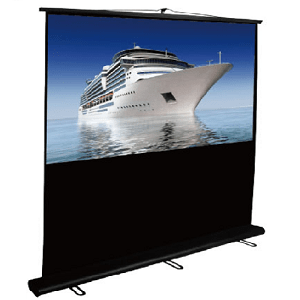 It is 1.8m wide and recommended as a rental product, for schools or for portable presentations in any conditions. It has a wide base for extra stability and a quality screen surface. This FF Series screen is big and strong. 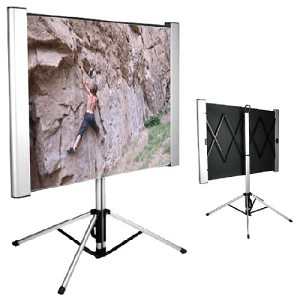 It is 4m wide by 2.5m high and comes with a grey Rear Projection surface, frame, legs and road case. This screen may also be suspended by fly-points built into the frame. Perfect for stage productions and outdoor events. 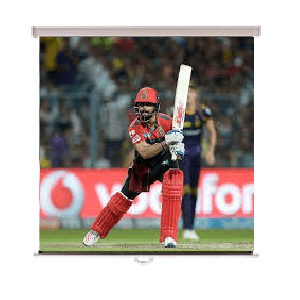 This 2m wide pull up screen is a big yet lightweight 16:9 format screen designed for Home Cinema. Use this in a flat or rental property and avoid damage to the walls. Retracts into a 2.2m long housing for storage. 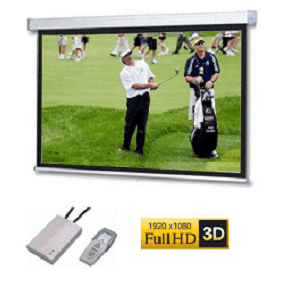 Compatible with all 1080p and 4k home theatre projectors. 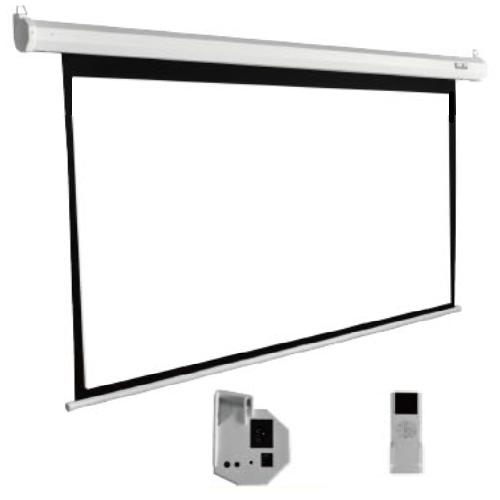 This PM series 2.3m wide screens has adjustable drop and works with all projection formats. Perfect for office, home or classroom. 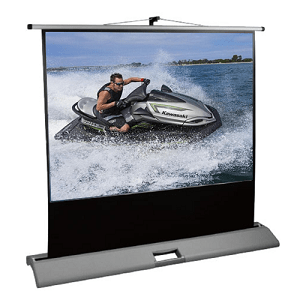 This screen drops down up to 2.2m and has a slow retraction mechanism and a quality stretch resistant projection surface. 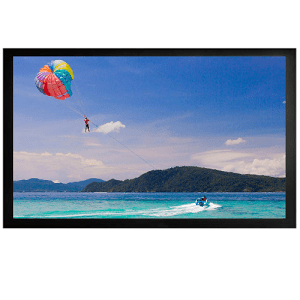 This premium wall mount fixed frame screen is 16:9 home cinema format and 3.6m wide (163"). 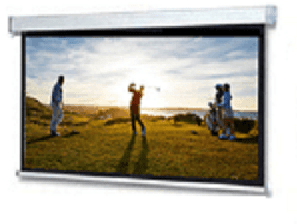 It features a quality screen surface, spring tensioning and a velvet covered frame. Recommended for larger home cinema rooms. If you have the skills to build your own screen or display, we have the screen fabric. This 3.15m wide screen fabric (as used in fastfold screens) is slightly stretchable and perfect for building screens tensioned on all sides. Simply edge the screen and tension it evenly on all sides. This Dark Grey starter kit provides maximum contrast for a better image indoors or outside where there is significant ambient light. 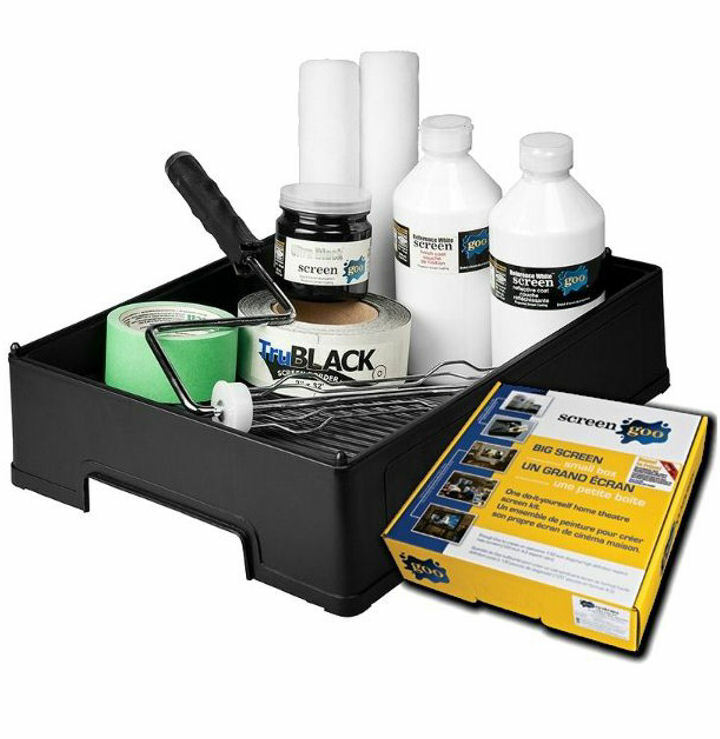 The kit includes a 1L base reflective coating and 1L top coat as well as ultra black edge paint, tray, tape and rollers. This kit will cover around 4.65m2. Recommended for bright rooms or flat outdoor surfaces. ScreenGuys.com.au is another secure e-shop owned and operated by ©Online Business Pty Ltd (ABN 46 134 020 045) operator of Australia's largest range of Vertical Market E-Shops. We are based in Sydney and ship only Australian sourced equipment from warehouses located throughout Australia.